All transactions are safe and secure with a reliable history in online purchasing behind each of our associates. 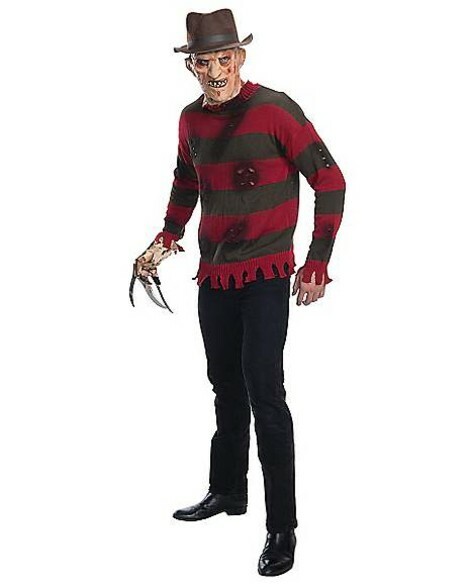 Buy the Freddy Krueger Costumes to own Nightmare on Elm Street clothing and merchandise. Our Nightmare on Elm Street costumes include male and female Freddy costumes complete with fedora hats, scary masks, razor gloves and signature olive and red striped sweaters. We have everything you need to scare the life out of your neighbor during trick-or-treating or your friend at a Halloween party. There are also props available that are ideal for creating a horrifying holiday atmosphere. To tide you over for the rest of the year, watch the Nightmare on Elm Street movies or collect Freddy Krueger action figures. In addition to the Freddy Krueger Costumes above, browse the Nightmare on Elm Street Clothing Gallery for more apparel like men's and women's clothes, kids shirts or hoodies.